A list of wonderful independent shops and galleries who have exhibited my work; past, present and future as well as past and current group and solo exhibitions. These places are special - so while you’re here have you heard about the #JustaCard campaign? Print at the Priory, Lanercost. Printmaker Sarah Robley has organised this exhibition of 18 selected printmakers, working in a variety of media, from lino print and lithography to collagraph. This is the first of what she hopes will be an annual event, held in the beautiful and historic Dacre Hall at Lanercost Priory. Well worth a day out, as the Priory, award winning cafe and proximity to Hadrian’s Wall give added interest to what promises to be an exciting showcase of some of our best contemporary printmakers. Craftsmen at the Priory, Lanercost. I was honoured to be invited to take part in this well established event in the beautiful setting of the Dacre Hall, Lanercost Priory near Hadrian's wall in Cumbria.I'll be invigilating for 4 days during the show so I'm really looking forward to visiting an area that's new to me. Inked Images with Cumbria Printmakers at The Old Courthouse Gallery, Shop. A group exhibition with Cumbria Printmakers, including workshops. I am running a cyanotype workshop on Sunday July 29th, please book by following the link below. Art in the Shed, Osmotherley. A fabulous, bohemian weekend event held annually in the Osmotherley garden of artist Jane Thorniley-Walker. Local artists gather to raise money for the charity Street Child Africa by selling paintings, prints and textiles as well as serving delicious cream teas and home made cakes. Folklore at Hamilton House, Bristol. Ferrers Gallery, Ashby de la Zouch. Framed originals are included in Winter exhibitions at this fabulous gallery in Leicestershire. "Ferrers Gallery is a multi award winning independent gallery promoting British contemporary craft. The gallery is set in the beautiful landscape of Staunton Harold near Ashby de la Zouch, Leicestershire, and has three floors featuring the best of British Contemporary Craftsmanship, with jewellery, ceramics, glass, textiles, paintings and sculpture." A joint exhibition with Cumbria Sculptors and the Wordsworth Trust who will be linking the words of William and Dorothy Wordsworth to some of the work on show. I've also been inspired by the work of Grasmere poet Polly Atkin and her recent book "Basic Nest Architecture", working on prints derived from digital sketches and stitch motifs. cyanotype and stitch with words by Polly Atkin. "Located in the Scottish Highlands, in the lovely coastal village of Golspie, East Sutherland, we are relaxed and welcoming. We showcase an interesting and ever-changing selection of contemporary craft, original art and innovative design." Golspie Gallery began stocking my cards and embroidered notebooks in 2016 and now has a selection of table lamps and lanterns as well as new greetings cards to add to their offering. The gallery also holds art and craft workshops which make a visit in the near future even more tempting. This lovely gallery opposite King's College has a small selection of my mounted prints and greetings cards. This summer, for the second year, I'm taking part in their Mixed Summer Exhibition. Upfront Gallery Gift Shop, Unthank. You can now find my printed wood and ceramic jewellery boxes at the fabulous Upfront Gallery shop. Upfront Gallery and vegetarian restaurant are located near Penrith, Cumbria in a rural setting in beautifully converted 17th century farm buildings. The gallery is the home of Upfront Puppet Theatre and the workshops of artist, John Parkinson, who is the co-founder and owner of the gallery, along with his wife, Elaine. The gallery presents a changing program of exhibitions throughout the year. In mid January it holds the "Upfront Open Exhibition". This is a selected exhibition by a panel of judges and entries are welcome from artists from Cumbria and beyond. This beautiful floristry shop in Cockermouth opened in April 2019. Owned by the equally beautifully and skilled Samantha Ryan, who I first met at the Plastic Free Market in the town, organised by Goodness and Grain. Sam will be stocking a small selection of my cards and possibly some other larger pieces later on. The Moon & Sixpence Coffeehouse, Cockermouth. For the second year Cumbria Printmakers, Cumbria Sculptors and Wordsworth Trust collaborate to bring together a celebration of art and poetry in Grasmere's beautiful village hall. The preview evening from 7pm on September 17th will include poetry readings from verses specially chosen by Dove Cottage outreach team, to compliment the artwork. Cumbria Printmakers and Cumbria Ceramics at Upfront Gallery, Hutton-in-the-Forest. Preview evening Thursday 13th September. This exhibition takes place in the wonderful surroundings of the Upfront venue which also houses a purpose built puppet theatre and vegetarian cafe. Art in the Pen, Thirsk. For the second year I'll be back in Thirsk for this lovely event on my old home ground. Last year was a really successful show for me and it was wonderful to see so many old friends from my old life in North Yorkshire and to make some new ones too. Lots of great artists and makers taking over the cattle mart and being super friendly. Theatre by the Lake, Keswick with Cumbria Printmakers. An exhibition running alongside the theatre's production of The Secret Garden. "Using themes from the story The Secret Garden, Cumbria Printmakers have challenged themselves to produce work interpreting the play in visual form, sometimes more obviously, sometimes more abstractly, with themes of secrecy, hope and re-birth. Cumbria Printmakers are a loosely Cumbria based group of artists working in diverse methods of printmaking; from Lino to Lithography, Cyanotype to Collagraphs. They offer workshops, demonstrations and exhibitions to showcase both traditional and experimental methods of printmaking in all its forms." Hairst Exhibition, Bonhoga Gallery, Shetland. Bonhoha Gallery is part of Shetland Arts and I was really honoured to be invited to take part in this exhibition alongside highly respected artists and makers such as Hilke MacIntyre and Hannah Nunn. Recent Hare designs were part of my preparation for this as apparently they are common on the islands...somewhere I'd love to visit one day. A customer's photo of the exhibition, shared with thanks. "...a group of 30 enormously talented, professional artists who make prints using a variety of printmaking techniques, from collagraph, lino, cyanotype, screen printing and etching to printing onto textiles and into ceramics." Bessemer II now stock my cards, lanterns and jewellery in this lovely Sheffield gallery and coffee shop (the cakes look pretty fine).
" 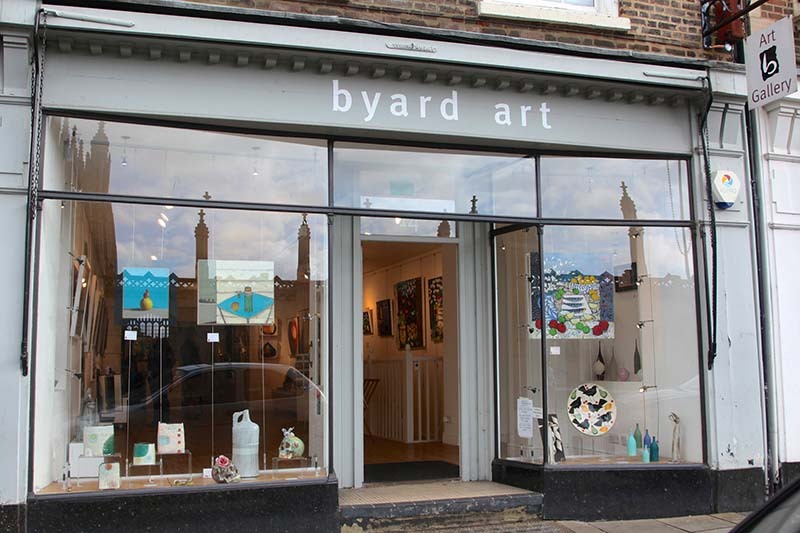 situated in the historic North Yorkshire Georgian Market Town of Easingwold. This vibrant and friendly town is home to many independent shops and is fast gaining a reputation for its food and cafes. With the opening of our gallery in May, 2015, we hope that it will also become known for its art! We are working with some of the most talented artists in Yorkshire and beyond and are proud to showcase their work. Studio glass sits alongside turned wood, bronze and pewter. Paintings, etchings, potato prints and felted scenes adorn the walls and jewellery sparkles in glass cases." Michael and Sarah are great supporters of artists and independent businesses though their work to promote the #JustACard campaign. The have a small selection of cards and embroidered notebooks. A well established event in the beautiful North Yorkshire town of Masham, famous for its sheep fair and breweries. 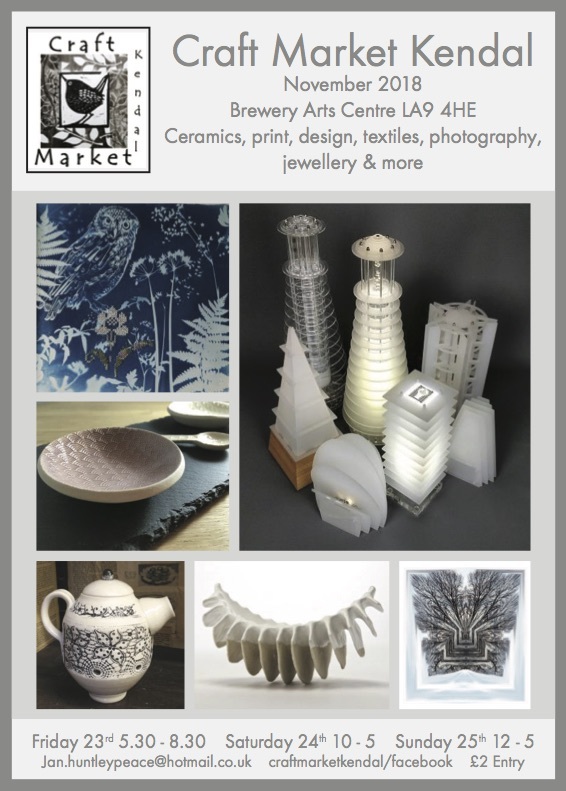 There will be 40 stalls from selected makers including jewellery, ceramics, glass, sculpture, printmaking and artist books.The event is supported by the Masham Gallery. “… a warm and inviting independent contemporary gallery in the heart of Hebden Bridge, West Yorkshire. Nestled beneath rolling hills and breathtaking landscapes, Heart Gallery is a gem occupying part of a former Baptist Chapel in its own grounds. A gorgeous shop in beautiful Somerset. Seed now stock a small range of my greetings cards in a shop dedicated to carefully selected art, craft and gifts. Chester's by the River, Skelwith Bridge, Ambleside. Chester's has become a favourite place to visit for delicious vegetarian food, vegan donuts, books, cards and other gifts. The cafe terrace overlooks the river and there is a takeaway bakery with outdoor seating also serving excellent vegetarian treats. Chesters now stock a full range of my greetings cards. Sam Read's is the tiny jewel of a bookshop, on the corner of the green, in Grasmere; where I have spent most of my pocket money over the past 4 or 5 years. Sometimes, if I'm good, they let me do the odd days work in there too which are some of the nicest "day job" days I've ever had. I'm so happy that they now have a small selection of my cards on the same shelf as one of my favourite illustrators, Jackie Morris! "beautiful, contemporary items for you and your home: lovely fabrics, delicate ceramics, art and photography, books and publications, lots of special yarns, French bath and home products,sheepskins from Skye, beautiful men’s shoes, lovingly-upholstered chairs, hats, shawls, quilts, throws, Turkish hamman cottons... and lots, lots more.It's a very special space for people who like beautiful, tactile items and want to give them a loving home." This lovely gallery is run by the mosaic artist Helen Clues and is also a venue for creative workshops. If you look closely you can see some of my vases on show in this beautiful sunny space. Art in the Pen, Thirsk and Skipton. "Art in the Pen features the best in modern, conceptual and contemporary art in friendly and innovative venues. Come and spend an enjoyable day exploring a diverse range of art and crafts for every budget." "To coincide with, and celebrate, Aylesbury's first Children's Literature Festival.... a fun exhibition of art featuring creatures - fantastical & fantastic!" This exhibition includes my favourite piece "Sometimes I want to Hibernate till Spring..."
*UPDATE Following the successful sale of the piece pictured above there will now be some more smaller pieces on show throughout the winter. "A unique collection of handcrafted goods , a showcase for quality , skill and originality. Dedicated to promoting the work of talented designers and makers from the region and around the UK. Passionate about keeping small towns and communities alive and actively participating in that endeavor by offering an alternative to mainstream shopping and mass production."